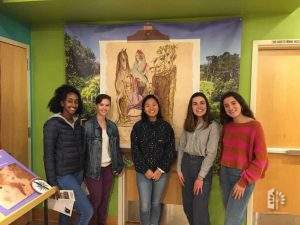 High school students have been gathering to plan a first-ever Open Mic Poetry Night at Los Altos History Museum, in conjunction with the bilingual Juana Briones exhibit. The students used social media to reach out to peers at many area high schools from Mountain View to Los Altos, East Palo Alto to San Jose, to share poems or join the audience on Saturday, March 30th from 7-8:30pm. The students see many contemporary connections to Juana, even though she ran her ranch and was an herbal healer over 150 years ago in this area. High school poets are invited to present original work on any theme related to Juana’s life and theirs, including identity, healing, legacy, family, and heritage. All ages are invited to join the audience and tour the exhibit which will open at 6pm for the evening. A student-designed poster by Makeda Yezalaleul, a student in the Freestyle Academy Program at Mt. View Los Altos School District, incorporates art done by Urna Bajracharya, who participated in a two-week summer workshop studying Juana Briones to create installations for the museum exhibit. By honoring Juana Briones through original poetry, this event is a great way to celebrate Women’s History Month. Students interested in participating may register at the event, or in advance at.